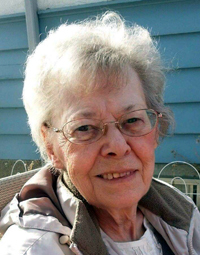 Peacefully at the Portage General Hospital on Monday, April 1, 2019, Mrs. Ann Bernardin of Elie, Manitoba passed away at the age of 75 years. She leaves to mourn her husband of 54 years Rene; her children, Kevin (Kim), Darcy (Mary), Michelle and Patrick (Carmel); her grandchildren, Dean, David, Daniel (Gabi), Darin, Samantha (Cody) and Joseph. She also leaves to mourn her siblings and in-laws, David (Fran) Derksen, Barbara (Abe) Buhr, Nettie (Amel) Turko, Fr. Robert Bernardin, Yves Chabot, Lea Bernardin, Claire Rivard and Simone (Wolfgang) Pfuetzner, as well as numerous nieces, nephews, relatives and friends. She was predeceased by her parents William and Aganetha (née Redekopp) Derksen, parents-in-law Joseph and Angeline (née Gervais) Bernardin; her siblings and inlaws, Tina (Bill) Zacharias, Helen (George) Redekopp, Jakob (Annie) Derksen, Bill (Carol) Derksen, Mary (Peter) Warkentin, Cecile (Ulric) Dufour, Leon (Anna) Bernardin, Armand (Emma) Bernardin, Lucien Bernardin, Lucien Bernardin, Jean Bernardin, Helene Chabot, Olivier Bernardin, Laurent (Noelline) Bernardin and Noel Rivard. Funeral Services will be held in the Elie Blessed Sacrament Church on Monday, April 8, 2019. Prayers and Eulogy beginning at 1:30 pm followed by Mass, with l’abbé Michel Nault officiating. The family wishes to thank the Doctors, Nurses and staff at the Portage Hospital for the excellent care Ann received during her stay. In lieu of flowers, memorial donations may be made to Manitoba Lung Association, 1 Wesley Avenue, Winnipeg, Manitoba R3C 4C6.